With cremations being the most popular funeral choice in the UK, Lambeth Crematorium offers a fitting location to say goodbye to a loved one. Filled with beautiful trees, gardens and an abundance of wildlife, you have a serene and dignified setting to celebrate their life. Lambeth Crematorium opened in 1958 within the grounds of the adjacent Lambeth Cemetery. The Gardens of Remembrance are set in 10 acres of peaceful well-kept lawns surrounding the crematorium chapel. The peaceful semi-formal gardens are planted with roses, lavender and heather, amid well-kept lawns and shaded by mature trees. If you have any questions, you can contact the Bereavement Services team Monday to Friday, between 8am and 4pm. Call us on 020 7926 4221 or send us an email. Or you can fill in our contact us form. Funeral services for all faiths or none at all may be held here. We're happy to accommodate most special religious customs that may be requested, if given sufficient notice. There is no duty minister at the crematorium, but you will be able to arrange one through your Funeral Director. Chapel services are 30 minutes long within a 45 minute time slot. Extra time can be arranged at the time of booking. You can choose to hold the main ceremony at a separate place of worship, followed by a short committal service at our chapel. After the service you’ll be guided outside to see your floral tributes which will be left on view for a week unless you have made arrangements to donate them elsewhere. The crematorium chapel can accommodate around 70 persons seated with room for more standing. Furnished in modern style in the round, this imparts a more intimate family atmosphere. The building is full of natural light and there is a comfortable waiting area. Full length curtains can be drawn at the end of each service according to taste, to remove the coffin from view. The coffin may remain on view until all mourners have left the chapel. There is a recently installed Viscount two-manual organ for which you’ll need to arrange an organist through your Funeral Director. There is state of the art CD and tape equipment operated by our attendants, both for playing and recording the funeral ceremony if required and a CD Room projector to show favourite scenes from the life of your loved one. You may wish to take the cremated remains away, and we provide a suitable basic container for this purpose. Alternatively our attendant can scatter the cremated remains on the lawns designated for this purpose. You may be present if you wish appointment, when the scattering takes places. Should you have a private grave you may like to scatter them or bury them within the grave, with the current grave owner’s permission. Ten acres of garden surround the main chapel building and radiate with colour and harmony all year round. The gardens have well-kept lawns and visitors are welcome to come and enjoy the serenity and beauty of the mature shrubs and borders. The Garden of Remembrance is a special area set aside for cremated remains. 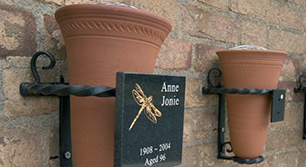 You can arrange with our staff to scatter your loved one's remains in the garden. You can also arrange for the purchase and planting of memorial rose bushes and you're welcome to place floral tributes on the paved platforms on either side of the Book of Remembrance room. A section of the garden is wooded and a small glade area has been cleared. In the spring, the glade is carpeted with crocuses and daffodils. There are trained, sympathetic staff at our office who will help you in your choice of memorial. We offer a family cremation plot, which is like a small family grave, and can accommodate four cremation urns. A small headstone is placed over the grave, and suitably inscribed. 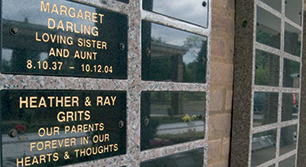 A variety of smart new granite memorials are now available, which can be dedicated in memory of your loved ones. Sanctum 2000s a small above ground vault, which can accommodate two urns, or dedicated granite benches, vase blocks and wall plaques. On the chapel walls there are available terracotta vases with inscribed granite plaque. In the gardens a memorial rose can be dedicated to someone special and marked by a bronze name plaque. All of these memorial options can be dedicated for varying periods, and renewed on expiry. One lasting memorial is an entry into our Books of Remembrance, which does not require renewal. Smaller copies of your entry can be ordered in booklet or card form to take home, or give to family members. The book is in its own small chapel next to the main crematorium building and the pages are turned daily. On the walls of this chapel there are attractive blue leather wall plaques set in solid indigo wood frames with dedications tooled in real gold lettering. 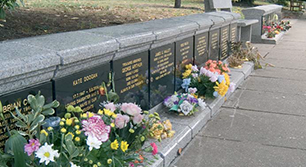 We have a range of memorial plaques available at Lambeth Cemetery and Crematorium. This is only available at Lambeth Cemetery and Crematorium. We have a variety of memorial options for you to choose from.